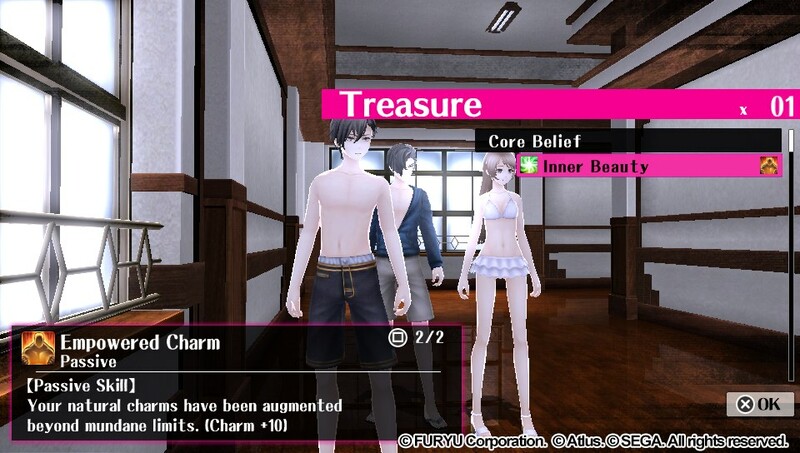 The idea – and philosophy – behind ‘reality’ is a subject that Japanese developers are clearly finding very interesting at the moment. Persona 5, Akiba’s Beat, and Digimon Story Cyber Sleuth from last year, all made the blurring between whatever objective reality there might be, and each person’s individual reality, central to their respective themes and narratives. Related reading: More on the topic of constructed realities and the social impact of that here. It’s not surprising that Japanese developers would be thinking about such things; the blurring of reality is something of a cultural trend in the country at the moment. The sheer enthusiasm for VR, AR, and wholescale adoption of digital celebrities such as Hatsune Miku, has meant that the very idea of reality is far more subjective now. People can – and indeed do – create their own realities that suit their aesthetics and worldview. There are certainly social implications to this. As I’ve mentioned in the past, when I was in Japan last year, I went to an art exhibition which was all about apocalyptic hypotheticals, and these “constructed realities” were a couple of potential world-ending catalysts. Japan, with its hikikomori, plunging birth rates, and supernormal stimulants, is right at the forefront of a technological revolution that is disrupting conventional social interactions and replacing them with people building spaces and worlds that they find more suitable. 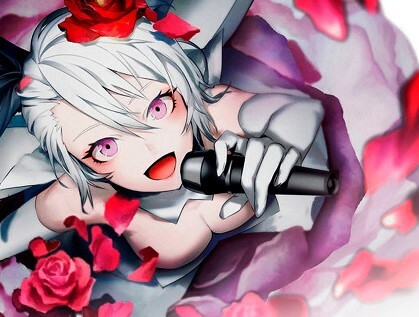 The Caligula Effect on the PlayStation Vita is yet another game that tackles this theme. In fact, unlike Persona 5, it’s the entire thrust of the game, and unlike Akiba’s Beat, this isn’t a B-grade game done for laughs-and-giggles entertainment. Give this game a chance and reflect on it, and you'll actually find it quite a dense game. So dense that it struggles under its ambition at times but, as someone who is pretty interested in this whole idea of constructed reality, whoo boy – did I find everything about Caligula to be quite incredible. You play as a group of friends who have been pulled into something of an alternate universe. One that’s an exact replica of the real world, with the key difference that the world is structured around a digital being, µ (muse), whose influence in the world has corrupted the minds of many to the point where they are violent and unthinking “fans” – they’ll attack the group on sight, simply for trying to leave this reality, which, were they to do so, would threaten the existence of the world in its entirety. Most of the other denizens of this alternate world are not aware that this new world they inhabit is not the “real” reality. It’s a kind of mass delusion, and aside from the heroes, most of those that are aware of what’s going on don’t even care. The world around µ is one of decadent luxury; people don’t need to worry about responsibility, and they can indulge their every whim, their every dream is met. Why would they even want to leave? This is where the “Caligula” in the title comes from. Caligula was a Roman emperor who has become infamous for his lavish decadence and sexual perversity. As we’ve seen immortalised in films (Caligula, 1979) and the like since, Caligula is remembered as someone corrupt who used sheer opulence to divert his gaze from those parts of the world he didn’t like. To Caligula, the world was one of extravagance, of parties and orgies. Almost all of his work as emperor was dedicated to improving his own space in the world; he liked building palaces more than he did representing the people. The mass delusion that the heroes fight against in Caligula works a bit like cutting through the hazy fantasies of Emperor Caligula’s vices, and while the game’s screen writers at times struggle to explore the greater moral and ethical themes that sit at the heart of this game’s narrative, the ideas really are there. As a consequence of the game itself not being over-indulgent (you’d be able to finish this one a couple of times over in the time a single runthrough of Persona 5 will take you), there are moments when the narrative quicksteps its way through. I almost wish more time was spent fleshing out the themes, but at least it presents differing perspectives on the social, cultural, and personal implications of people participating in a self-constructed reality. Related reading: Lost Dimension, by the same publisher, is another excellent, smart, tactical JRPG. Matt's review. What the game doesn’t speed through only becomes evident after the introductory chapters. At first impression, Caligula’s characters are more functional tools than a focus; the game seemed more geared towards its overarching philosophies than getting us to love the people on the screen. This flips as the game progresses. In fact, there are a lot of character narratives in Caligula, and many of them are incredibly intricate… and many of them are more than a little dark. In playing the game it’s easy to understand the attraction of this alternative world for a lot of the characters. 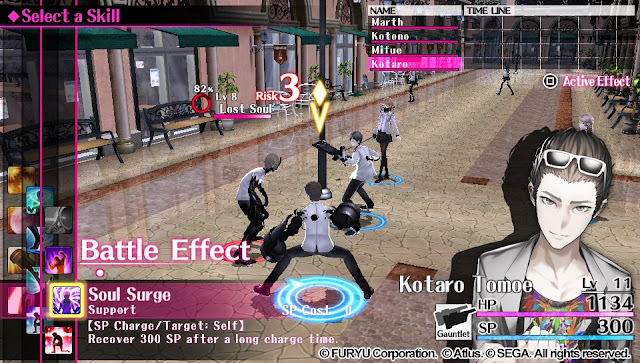 There’s an intensity to some of these themes that might make players uncomfortable, but coming from the writer of the early Persona games, it’s unsurprising in the end that the characters are so well written, and what happens to them can impact so forcefully on the player. The intriguing narrative is backed by one of the most enjoyable and nuanced combat systems that I’ve ever seen in a JRPG; it’s so good, the developers clearly had no idea how to make the most of it. It’s nominally turn-based, where you’ll queue up to three attacks for each character in your party. Once all that’s done, the actual turn plays out in real time. What’s interesting here is that each attack and action takes a different length of time to complete, and each character has attacks and abilities that work best when timed with something that another character has done. So, for a simple example, one character might be able to knock an enemy into the air, and a second character might be able to execute an attack that does massive damage – but only to enemies in the air. You’re also able to adjust the timing for each individual character, to force some to wait for others to take their turns first. All the while you’re also trying to avoid the enemies themselves, who also attack according to specific patterns and timing. Placement around the enemy is important, for some attacks have a wide reach. 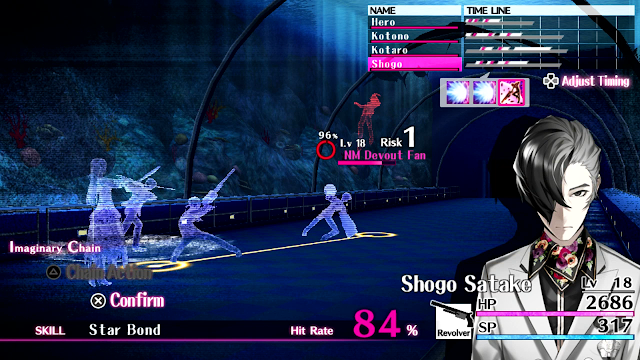 It’s also possible to use some of your own attacks to disrupt the enemy’s momentum, and vice versa. Once the combat is in motion it’s really quite musical in its dynamics and flow, and this is appropriate given how strong the musical theme runs through the characters’ struggles against µ. When planning out tactics, however, you’re really encouraged to take your time and carefully structure every movement to the nth degree. 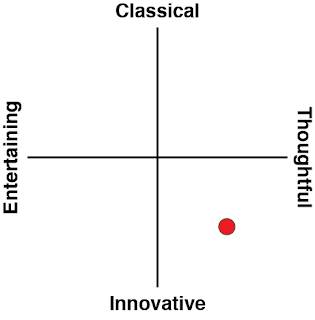 This… this is like a composer jotting down notes and bars of music on blank paper. 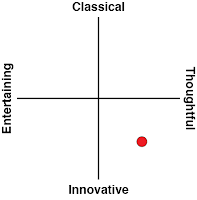 It’s a system that encourages you to be both creative and clever. Sadly, the developer wasn’t able to put up a challenge that deserved the combat system. 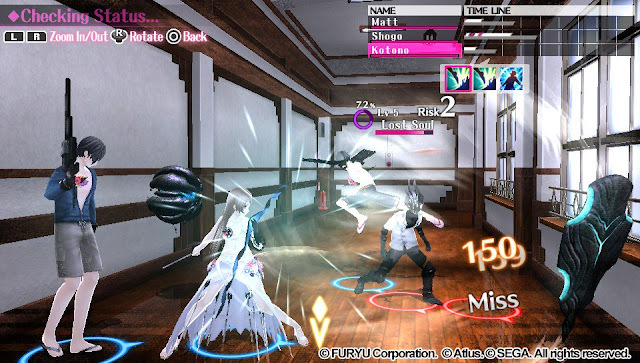 Boss battles are one thing; an absolute highlight in Caligula, boss battles will have you testing out strategies, probing for weaknesses, and scrambling to keep allies alive over protracted battles of attrition. These battles are what the combat system was designed around, and I treasured every one of them. Battles with regular enemies, however, were not nearly as interesting. As long as you’re keeping your party at the right level (by battling the often unavoidable enemies along the way), these regular opponents are easily defeated in one round using the same basic attacks over and over again. This isn’t what the combat system was built for, and I don’t think Caligula benefits from being a regular JRPG with incidental fights along the way. There’s enough other stuff going on in the game – it’s got a rich social system for interacting with NPCs, for example – that I can’t help but think that the game would have been stronger if it only featured set piece battles called for in the narrative. Thankfully the battles with common enemies don’t take too long to power through, and in the end it’s a minor irritation I have with Caligula rather than a genuine complaint. In every other way there isn’t a second of the game I didn’t find to be breathtaking. The soundtrack deserves a special mention because it includes music by producers well known in circles that are inclined towards these “constructed realities”, including producers like Oster Project who have worked with Hatsune Miku herself. This is all supported by art direction that is just incredible. On a technical level Caligula isn’t perfect; characters can run right through doors, and enemies have a habit of getting stuck in scenery as they chase after your characters, but the art direction itself with its soft pastel colours and clean elegance is a massage for the eyes. Boiling things right down, Caligula asks a question that’s really quite dear to my heart: “what if Hatsune Miku gained sentience and convinced us all that we would be better off living in a universe with her as queen?” I must admit that, were it me, I’d end up as one of the “villains” in this game, as I’m quite on board with that; but joking aside, The Caligula Effect looks, on the surface, like a bit of B-grade nonsense for a console well out of the mainstream’s attention. The great irony about that is that it’s far more pertinent and relevant, and asks genuine questions, about a topic that is going to be a significant sociological discussion point for generations going forward.